Opening to what is sure to be the trope of contemporary rom-coms, Two Night Stand begins with Megan (Analeigh Tipton) creating an online dating profile – filled with every hesitation, deliberation and embellishment. Megan, the low-key manic pixie, has just broken off her engagement with her high-school sweetheart, and after graduating finds herself doing nothing – bumming around the apartment to the behest of her roommate. Following another tale of a twentysomething graduate starved of ambition and not knowing what to do with herself, just as Kiera Knightley’s Megan in the recent Say When (serious), this Megan isn’t so much looking for meaning in life as a one night stand to get back on the horse. The eventual winner of this no-strings agreement is Alec (Miles Teller): a sardonic stoner who manages to offend his lucky catch as soon they wake in his Brooklyn apartment the morning after. But when she tries to make an exit and storm off, it appears that they have been snowed in by a freak blizzard and so must stay put and bask in the awkwardness of this forced situation. Unfortunately so must we as the audience – with awkwardness that isn’t always intentional. Two Night Stand definitely reaches for comedy over creating chemistry between its characters, and so the intimate scenes feel out of place with a whiplash of tone change – especially when the cheesy clinking music cuts short and leaves you with enough silence to hear Alec breathing. There are some laughs throughout but the match of this big eyed, elfin, beauty with the dry and cooly distant Alec plays out just as you would expect… with utter convenience. There are some laughs throughout and it has a cutesy charm that keeps you entertained, but it is largely inoffensive and forgettable at that. The roommate and her boyfriend were cringe-worthy awkward with no charm or believability. They felt like glossy, unapologetic devices for the story. The sound design clashed with the images as sound levels veered wildly and the awful demo-music samples didn’t even last as long as the scenes. At one point Megan’s nose stud jumps nostrils while in a side profile close-up.. whilst her face fills most of the screen. These little mistakes were amplified by the look and feel of the thing. Maybe Dan Harmon’s right when he says that romance is a condiment for a story, not the meal itself. In the wake of Martin Luther King Jr.’s historic ‘I Have a Dream’ speech, and after the supposed break up of segregation in the States, Selma picks up in the south where things don’t seem to have changed much at all – where four girls have been murdered by white supremacists and where black citizens are still prevented from registering to vote. When Dr. King (David Oyelowo) hears this news, he decides to use his platform to bring attention to this continued injustice by arranging a march from Selma to Montgomery Alabama. Although Dr. King is introduced accepting the Nobel Peace Prize, he is not shown to be an outright hero but a passionate and charismatic preacher who knows how to use a stage and move a crowd. No film had until now focussed on Dr. King and so it comes as a pleasant surprise that director Ava DuVernay avoids the pitfall of deifying this cultural icon and instead shows him as a man – a complex figure complete with all his faults and foibles. Oyelewo’s King presents the contrast of the man on and off stage: speaking with a measured poetic rhythm that erupts into familiar passionate cries when in front of a crowd, but thoughtful – at times doubtful and doubting even – behind closed doors. In showing this side to Dr. King, Selma is able to shift focus to the issues at the core of the film and observe the people that marched together on that momentous day, exploring their individual stories and struggles. 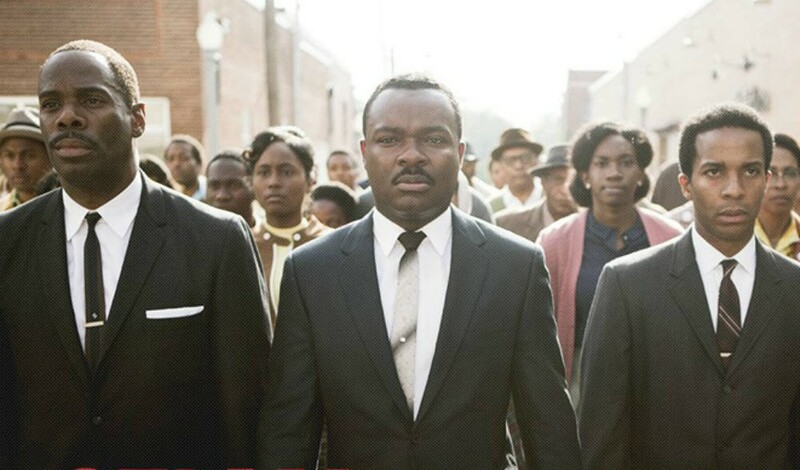 In a sense Selma looks at the human side of a legend, showing Dr. King to be an ordinary person, and the extraordinary side of regular people as they came together to stand up against oppression. Ivan Locke (Tom Hardy) must juggle the collapse of his marriage, pacify the pleas of the woman about to give birth to his child, and oversee the preparation of a job that he has just left behind in order to be at the hospital – all of this he must do on the drive from Birmingham to London constrained to the phone in his car. Ivan is a level-headed pragmatist whose efficiency is the evident force behind his success as a construction foreman. Though now, due to a one night stand with a woman he felt sorry for, he decides to be present for the birth, which means abandoning one of Europe’s biggest ever concrete pours for the base of a skyscraper. All we see of Ivan is how he interacts with others over the phone; how he deals with mounting levels of stress from all directions. Somehow – under the weight of overlapping crises – he maintains a rational distance that allows him to remain in control, even as events tear away from him and spiral. Ivan shares his name with the Enlightenment age English philosopher John Locke, who supported the theory of the tabula rasa, or: the blank slate. This theory proposes that humans do not have inherent or innate qualities, that they are instead shaped by their own experience. In the case of nature vs. nurture the blank slate supports the latter. This is the defining feature of, and prime motivation for, Ivan. Between phone calls he is caught arguing with the spirit of his late father, raging at empty backseat through the rear-view mirror, as though he is being beckoned from beyond the grave to become a failure and a bad father. Ivan uses this fury as fuel to break the cycle of nature – to prove that he can decide his own fate and straighten the family name. Not only does he decide to be present for the birth, but he tasks himself with overseeing an enormous job that he will likely be fired from anyway. This does not matter, Ivan has set a precedent of loyalty that transcends the divide of business and personal, significantly painted with the metaphor of laying the foundation of a building. But as he states himself of the skyscraper, if cracks appear at the base, support is compromised and it becomes a threat. Like the eponymous character, we too are locked in this situation; trapped in this single location for the journey. However, the film seems to not only be aware of this, but weary and apologetic, as it aims to keep things visually interesting by constantly cutting to external shots and various distracting angles. Shooting the entire film from start to finish in one take (or 37 minutes due to the capacity of the memory cards) and repeated two or three times a night for 6 days, the performance naturally has tension built into it’s construct and thus holds a pressure of it’s own. When permits to film on the M1 were revoked at the last minute, it is as though life was imitating art and echoing Ivan’s struggle to arrange road closures. Not only that, but the cold that Locke suffers is actually Hardy’s; the frustration that bursts out of Locke in reaction to the call waiting alert is Hardy’s too – actually reacting to the petrol gauge as it interrupted the drama and altered later in post-production. The tension of the film is palpable as it is, to some degree, real. Buried (2010), the single-location thriller released a few years prior, had a similar concept and incorporated a similar style, with sole actor Ryan Reynolds buried alive in a coffin experiencing a more life-threatening stress whilst other characters appear as voices in phonecalls. Focussed on a more extraordinary situation, this Hollywood film is suitably made into a spectacle through it’s set design which allowed this minimal space to be transformed. Locke, which is so gripping for its realism and its nuanced performance, does not need this escape or stylism. There is enough movement in frame to keep the your attention and Hardy offers a captivating performance in the subtlety of his acting: each micro-expression magnified by the intensity and intimacy of the camera. When Ivan first smiles it comes as a relief, it feels sincere and hard-earned and so we experience this same satisfaction. It seems that this could have all been heightened if the direction hadn’t taken attention elsewhere – it was as though the film’s strength was being treated as it’s weakness, and so it missed out on the payoff of its bold simplicity if it had simply let the action unfurl in longer, uncut takes. That being said, the tension is inescapable still, and the film is undoubtedly ambitious as it is. An impressive film that shows the capacity of film to do so much with so little.. and Tom Hardy.